As a component of the Neostrata Prosystem retinol peel, Retinol is a vitamin A acid which is the natural precursor of retinoic acid. It is noteworthy that it does come in various strengths and at varying purity and concentrations. Retinol, along with vitamin C, hyaluronic acid and frutis acids, is the most effective ingredient against wrinkles and loss of firmness. As a result, retinol has an exfoliating effect that smoothes skin texture and gives a natural glow. In addition it contains anti-oxidant properties that allow the regulation of melanocytes. Neostrata Prosystem Retinol Peel is very effective when obided by a very precise protocol. At Epilium & Skin, only our nurse performs this specific peel to ensure the desired and optimal results. What is Neostrata ProSystem Retinol Peel? We love Neostrata Prosystem Retinol Peel as it reduces the signs of aging. In addition, it improves the skin texture & enhances skin complexion for immediate visible results. Neostrata Prosystem Retinol Peel is a high-performance peel that contains 3% Retinol plus Retinol Boosting Complex™. The chemical peel’s immediate outcome is a reduction of fines lines and wrinkles. This is thanks to the advance technology of the skin exfoliation. For individual who suffer from acne, the Neostrata Prosystem Retinol Peel is an incredible treatment option. You will see visible results within 2 to 3 treatments. In addition of clearing acne, the peel will improve the skin laxity while promoting a brighter, even and clearer complexion. 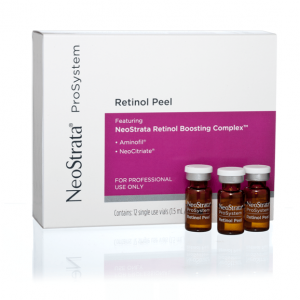 It is important to note that this is the first and only Retinol peel in NeoStrata collection of peels. The peel contains an innovative blend of scientifically proven ingredients to complement the 3% Retinol. At Epilium & Skin, our aesthetic nurse will cleanse the skin & apply the NeoStrata ProSystem Retinol Peel. Futhermore, the patient will leave with the peel applied and will be required to wash it off in the comfort of their home 8 hours later. Most noteworthy, the peel doesn’t colour the skin, so the patient can resume to his/her normal activity straight after its application. Once the peel has been removed, patient’s should expect mild skin flaking for 3 to 5 days upon individual skin types. Post-peel, we recommend to moisture your skin twice a day, use an SPF 50 protection every morning and also, drink a lot of water to support the new skin production. At Epilium & Skin, we advise a course of 3 treatments a month apart for optimal results.